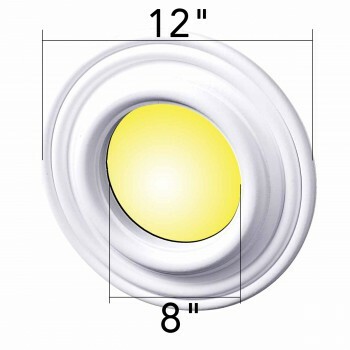 Recessed Lighting Trim: Made of virtually indestructible high-density urethaneRenovator's Supply's spotlight rings are cast from steel molds guaranteeing the highest quality on the market. High-precision steel molds provide a higher quality pattern consistency, design clarity & overall strength & durability. Lightweight they are easily installed with no special skills. Unlike plaster or wood urethane is resistant to cracking, warping or peeling. Factory-primed Renovator's Supply's spotlight rings are ready for finishing & enhance any ceiling light fixture. 12 in. dia.